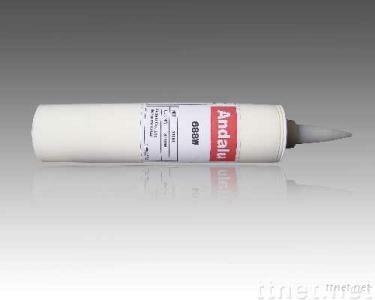 General description: ADL-688W is single component neutral RTV silicone adhesive. It makes condensation reaction through the moisture in the air, produce low molecule and occur crosslinking, finally vulcanized into high performance elastomer. The solidified elastomer has good electrical performance,anti ageing, high and low temperature resistance, insulation, no swelling, and has good bonding ability to most metal and non-metal materials, and can use for the sealing of many kinds of electronic components and electronic products, no pollution to surroundings. Application: It is used in bonding,sealing and insulating of the CRT kinescope,DY and so on,aslo applied to fix and bond PCBs,capacitance,audion.